Back in 2013, when it was announced it would be the final year that Underground Venues would operate out of Pauper’s Pit and the Barrel Room in the Old Hall Hotel, I wrote this article on what might happen next. As you may have noticed, nothing happened, and the in-joke that every year was Underground Venues’ last year ran on and on. However, the mood this year is that this time the developers really mean it and they want to convert the entire basement into a hot tub or something equally fancy. So unless everyone wants to set their plays in hot tubs, we need to look at where else they can go. Joking aside, this is something that Buxton Fringe ought to be worried about. 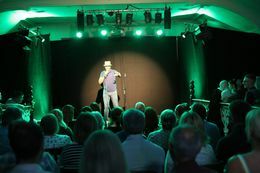 In recent years, applications to Underground Venues have gone up and up and up, but the numbers to Buxton Fringe overall have remained steady. So it looks like there are a lot of unsuccessful applicants who are opting for not come to Buxton at all. For one reason or another, it’s Underground Venues that everyone seems to love. It might be because of the community and spirit that’s been built up, or it could be that this is the only space with a proper lighting and sound system (apart from the intensely-contested Arts Centre). The apocalyptic scenario is that the loss of Underground Venues spells the loss of everyone who performs there. If that was to happen, this would decimate the theatre and comedy programmes at Buxton – the Buxton Fringe would still have a strong visual arts and music section to fall back on, but it would still be a huge loss. Now, when I list the possible “successors” here, I am using this in a loose sense. It could be a venue that the managers and volunteers move on to (and I get the impression that there is a very strong will amongst them to carry on in a new home), or it could be a new venue that performers choose to congregate to. In all cases, we need to consider what these venues currently lack compared to a full managed venue. Shows in 2016: 62, with 168 performances. Okay, this is a much less likely possibility than last time, but hey, it happened before so maybe it’ll happen again. It could be that we’ll see Underground Venues having yet another very last year next year, and once again the developers definitely moving in this time turn out to have not meant it. However, whilst it’s possible, is a much less likely possibility than the one I entertained in 2013. Back then, in spite of the public announcements that it was the last year, I quickly picked up doubts amongst the regular users that this would actually happen. That is not the case this time round, and I am being told both on and off the record that they expect them to mean it this time. Certainly the building site outside look ominous. So whilst this can’t be ruled out, this is very much an outsider possibility now. The last time I checked, Underground venues have the option to carry on managing the Arts Centre Studio if they want it. There is, however, a major snag: the Buxton Festival wants the Arts Centre during the day. This means the Underground Venues is restricted to evenings, and even the odd evening can be lost if a show at the opera house wants the space in the arts centre for whatever reason. Bottom line is that the 12 or so shows at the Arts Centre is all that can be accommodated. So should they opt to carry on running the Arts Centre Studio only, Underground Venues will change from an all-encompassing venue chain to a fiercely-contested exclusive single venue. In which case, we should still look at who else might pick up the excess demand. Capacity: Depends on seating, probably around 80. 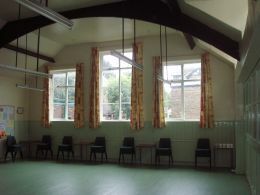 The upstairs room of Old Clubhouse has taken the odd theatre performance before, but it is almost exclusively used for music performances now. Nevertheless, this pub is in a strong position to step into Pauper’s Pit’s shoes if it wants to. Located in the hub of Buxton’s festivals next to the Opera House, Pavillion Gardens and Pauper’s Pit itself, it couldn’t be in a better position. There is also a strong precedent from Brighton Fringe, and although Brighton Fringe is outgrowing pub theatre in favour of super-venues, we know from Brighton that pub theatres can be successful fringe venues if done correctly. This option, I understand, was seriously explored by Underground Venues when they last thought they’d have to move. Conveniently, there’s a small room next to the big one that could work as a box office. Less conveniently, there’s currently no sound and lighting rig. That said, the odd theatre company has brought their own temporary equipment along, so there are ways around this – the only question is whether prospective performers would settle for this. A sticking point could be, out of all things, the Sunday carvery. The Old Clubhouse like their business from their weekly dining upstairs, and don’t seem prepared to give it up for three afternoons in July. And the multitude of stairs over the room would make it a bugger to reconfigure for any sizeable stage. I’m nominating The Old Clubhouse as my hot bet for a future home of stand-up comedians – theatre, I’m not so sure about. United Reformed Church used to be the first port of call for anyone who couldn’t get a slot at Underground Venues, and in spite of the lack of sound and lighting equipment, some acts still managed to be wild successes. Nowadays, with the emergence of some new venues, fewer acts go to URC than before. Nevertheless, with three spaces up for grabs, there is potential here for a new hub to replace Underground Venues. The obvious difficulty? It’s needed as a church. That doesn’t mean it’s impossible to be both. St. Augustine’s in Edinburgh holds the precedent here. That is both an active church and an Edinburgh Fringe venue. And, I have to say, I’m surprised by some of the stuff that they allow to be performed there; practising Christians in Edinburgh seem to be a somewhat liberated bunch. If you were to run this building as a major venue, you’d probably have to use one of three rooms as a box office, leaving the other two available as spaces. Like The Old Clubhouse, they’d have to find some solution over sound and lighting if they want theatre, but they do at least have flat floors. URC’s location isn’t great, and I can’t see this being a serious contender for comedy, but they could get a theatre programme running – if they’re serious about it. Back in 2013, the Green Man Gallery barely registered on the Buxton Fringe radar outside its obvious remit of visual arts. Since then, it’s moved to a more central location, which, conveniently, their building comes with a small stage and some basic sound and lighting rigs. They’ve taken on a variety of events, including those you’d least expect to take to this space. Both of the plays shown in 2016 went down very well, and they’ve even managed to scoop a couple of comedy acts, something that Underground Venues previously had a virtual monopoly on. Even if you exclude their exhibition of in-house artists from the figures, they’ve overtaken both The Old Clubhouse and URC, with their success, I suspect, coming at the expense of the other two venues. However, whilst they done well to get where they are, it’s difficult to see how they can become something like Underground Venues. Again, the obvious problem is that the space is primarily used as, err, a gallery, and performances have to settle with seats squeezed into one corner of the room. I cannot see them willingly sacrificing the gallery’s intended function to put on more Buxton Fringe plays. They only way I could see this working is if they can make use of some other rooms in the building. Apart from that, I’m rating this as an outsider. This is only occasionally used for Buxton Fringe performances, and there are two reasons for this. Firstly, it’s in the southern end of the town, far away from where the action is. Secondly, and the far bigger problem, its primary use is, of course, a school. Indeed, this year, the only group who opted for this was some former students of the very same school. 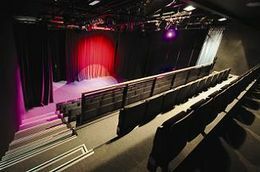 Nevertheless, this is worth considering because they have got something that no other venue has part from the arts centre: two purpose-built studios, one for drama, one for dance. Don’t fancy the prospect of URC or the Old Clubhouse or Green Man making do with makeshift sound and light? Buxton School has the real thing permanently set up. For what it’s worth, I think it would be possible to run this as a major Buxton Fringe Venue, but it would take a big effort on both the school and the venue organisers. You would have to identify rooms to use as box office and bar, decorate these rooms and the entrance to look like a fringe theatre and – this is a hard bit – set up up at 4 p.m. every weekday and take it down again for the following school day. My guess is that this would be too big a project to take on. But who knows? Shows in 2016: 0 (4 shows showing 10 performances when it last ran in 2014). This might be worth revisiting. The Market Place was an attempt in 2014 to set up a second managed venue in Buxton. Underground Venues were not involved in this, but they supported the venture and gave advice. Sadly, in spite of all the grand hopes, this turned out to be a bit of a disappointment, with only four shows booking. In my opinion, the biggest mistake was to publicise it as a high-end venue aimed at professional-level artists; that, I feel, gave the message that the venue was not for beginners starting off on the fringe circuit, and when you’re getting started as a venue, you need all the performers you can get. But the biggest problem was that The Market Place was already competing with an established managed venue, which almost everyone was happy to stick with. Now that the competition is out of the way, could someone give it another go? The practicalities? The Market Place is actually Level 2 Nightclub, Buxton’s only nightclub. I’ve no idea what the clubbing scene is like in Derbyshire’s favourite spa town, but I do remember seeing a sign in the club saying that anyone caught occupying the toilet cubicles were only to be used by one person at a time, and anyone breaking this rule would be ejected from the club. (This raises the obvious question of why someone would find it necessary to state something this obvious; off-hand I can think of two answers, and if it’s either of those, I don’t want to know the details.) Toilet goings-on aside, setting this up as a fringe venue should be doable from a practical point of view. Last time, they made do without sound or lighting or any setting up of stages other than arranging seating, but any of these could be done if there was enough demand. If you’re lucky, it might be possible to re-rig the existing lighting and/or sound used in the club. (Or they could forget about all that and operate like Espionage does in Edinburgh.) And there’s a ready-made bar. Only snag is that late-night performances may be out at the time when Level 2 wishes to revert to being a nightclub. Like Buxton Community School, this could be a serious contender for new hub of the Fringe – but again, it’ll only happen if someone’s serious about this. A wildcard here. When I first went to Buxton, there was marquee next the Poole’s Cavern which had a fair few events on, and it had its fair share of successful ones. Sadly, that was discontinued, leading to a six-year spell of dominance (albeit responsible dominance) from Underground Venues. This was a proper fringe space with sound and lighting set up in the tent, and apart from the inability to do blackouts during the daytime, it had pretty decent capabilities. But it couldn’t have helped that it was so far away from the hub on the fringe at the other end of town. But again, with the main venue in this hub out of the way, could someone give this another go? How enthusiastically would Poole’s Cavern support this? This might be an outside bet, but it’s too interesting a scenario to discount. And to finish with, a building that has never been a Buxton Fringe venue: the Crescent. The very reason we’re having this discussion in the first place. I’m throwing this possibility into the mix for two reasons. Firstly, one of the upcoming developments in the Crescent is a hotel. That may well include hotel suites, and as Sweet Venues have demonstrated in Edinburgh and now Brighton, these can be made up into decent fringe spaces, if somewhat hot. (Pauper’s Pit was hot too, but I’d say Sweet Waterfront 2 wins by a convincing margin on that front.) Secondly – and here I’m going into wild speculation – the new occupants of The Crescent might be keen to throw in a sweetener to compensate for Buxton’s favourite fringe venue. What better way that to provide a new one? One thing’s for certain though: it won’t be happening next year. The scheduled opening is 2018, so it’s open fight between the other eight for top venue of 2017. But it would be a fitting twist if the development that takes away Buxton’s key fringe venue ends up bringing in the new one.